Unfortunately, with only 10 weeks in South America, one of the tough choices that I would have to make would be forgoing the Inca Jungle trek (mountain biking, rafting and ziplining with some hiking thrown in). 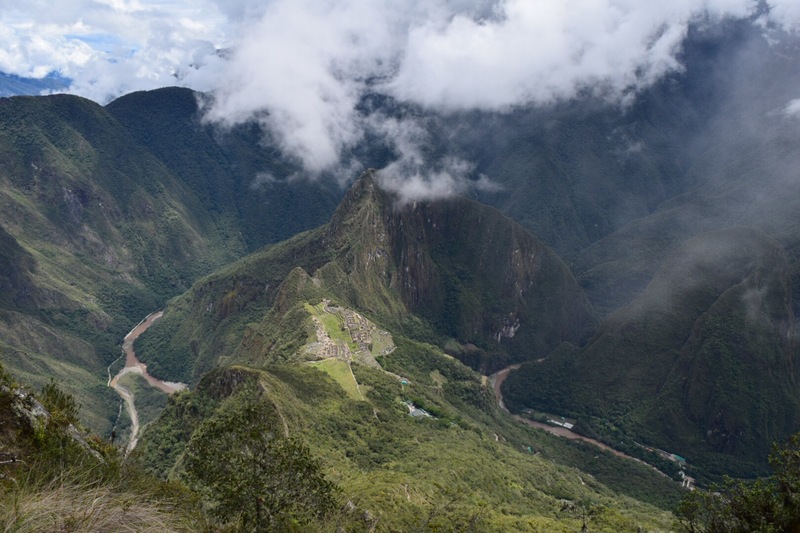 So I settle on a two day tour with Day One exploring the Sacred Valley, an overnight stay in Aguas Calientes (AC) and the Day Two would be at Machu Picchu (MP). I am still trying to get used to time constructs in South America. What I am sold is a tour that is supposed to begin at 8:00 AM but doesn’t start until nearly 9:30 AM. The first stop is some touristy shopping that should be 15 minutes long but a couple decides they’ll take however much time they want and we are there for nearly 40 minutes. 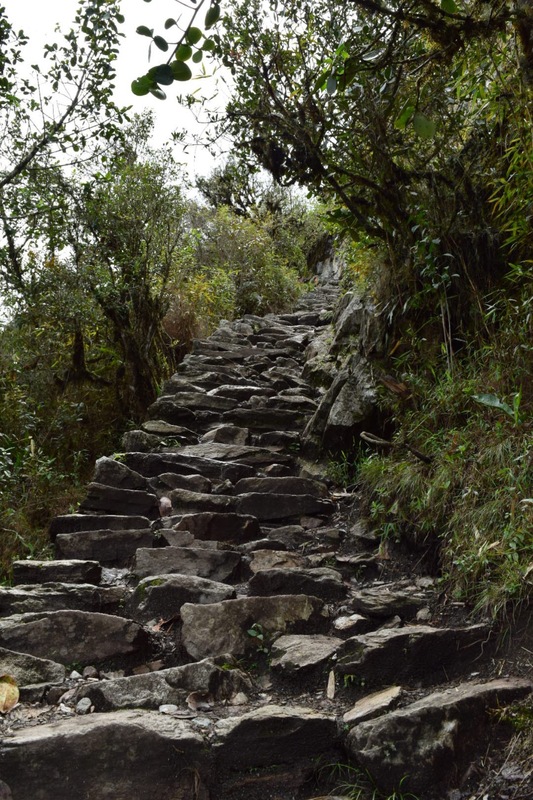 My time sensitivity is especially acute for this day because I wanted ample time to explore the two Inca ruins on the itinerary. I am trying not to be too upset and we finally make it to Pisac! The Incas did not have a written language but Pisac showcases the Incan ingenuity and knowledge in agriculture, astronomy, complex water engineering and irrigation systems, cemetery, religious and ceremonial areas, and military watch towers and garrisons. The guide was knowledgeable and bi-lingual so it was great for me to test out my Spanish listening skills and I developed a very deep appreciation for the Incas. Unfortunately, the delays prove to be a problem for this tour when we get to Ollantaytambo and I only have 40 minutes to explore the site. A young Czech couple also has tickets for that train so we leave the tour group behind and venture in by ourselves. Luckily we are all healthy and in very good shape as we have to take all our stuff with us through the ruins. We are able to get through the entire site and make it to the train station on time!! I wish I would have had more time at the only place the Incas were able to defeat the Spanish but it ended up being a great bonding experience with my newest friends. We make plans to have dinner in AC that night and they offer their place when I come to Prague on my next trip! It has been said that stated that the rail line to AC is the most expensive one in the world per kilometer. I am not sure if this is true but it wouldn’t surprise me since the popularity and expense of MP. My annoyance at the short time at Ollantaytambo is quickly forgotten when the train starts with this view of the river and the setting sun. As always, I end up talking with some interesting people – entertaining brothers from San Francisco and a very sweet grandson taking his grandmother for her first time around Peru. I could barely sleep the night before and am giddy with excitement at 5:30 in the morning as I walk to the bus station. I can barely believe that I will soon be gazing at one of the new Seven Wonders of the World. We drive through the clouds and mist and even this part of the journey is breathtaking…the bus climbs higher and higher until finally reach our destination: the entrance to MP! I had wanted to watch the sunrise at MP but it has risen an hour earlier than when MP opens so I guess that will have to happen my next trip. My tour guide was extremely late for our first meeting last night, so I do not have high hopes for him showing up at the agreed upon 6:30 AM meeting time. As I am waiting, another tour guide offers to call him and we find out that he won’t be at the mountain until 7:30 or 8:00 and I have to be at the entrance of the Montaña by 10:00 or I will not be allowed entrance. The other guide is helpful and I am offered an alternative tour – but it will be with a group and in Spanish. I agree and join Rosa Linda for an enlightening and entertaining two hours. Luckily my Spanish has gotten pretty good at this point to understand most of it or ask clarifying questions when necessary. We have discussed the fact that I am a nerd, right? I love learning! And the group is welcoming and so curious about me. We talk about the US, about my solo traveling, why I am single, what I think of South America, and take lots and lots of pictures ~ I feel like a celebrity already and then it gets weird when people not from our group want to take pictures with me. But soon time to head to the entrance of the Montaña and check in. So there is the normal entrance ticket to MP and then there are limited entrance tickets available (400 daily -each) for Huayna Picchu (HP) and Montaña Machu Picchu. HP is that rhino horn shaped mountain seen behind the ruins in most MP pictures and also has the Temple of the Moon but tickets are sold out often weeks or months in advance. So that is how I ended up with a Montaña MP ticket but the Ministerio de Cultura agent was right, it was underrated (probably also due to the higher climb) and did offer an awe inspiring view. The Montaña is located on the south-west side and you end up climbing 2,139 feet (652 m) from MP to a total of 10,111 ft (3,082m) above sea level. First picture shows the well marked but steep path and it took a little under an hour to make it to the top for me and I was told it would take 2-3 hours. And all of that effort resulted in a spectacular and panaromic views looking down at MP, HP, Putucusi Mountains and the Urubamba River winding around MP. It is absolutely stunning and luckily I met a nice German fellow who also has a fear of heights to distract me with conversation on the way down! So Machu Picchu is the only place that EVERY SINGLE PERSON that has been there tells me that it is worth going to…and I will join that chorus. Holy moly, it is incredible. Yes it is a tourist spot with lots of people but there are places that you can walk to and enjoy the silence and just take it all in. 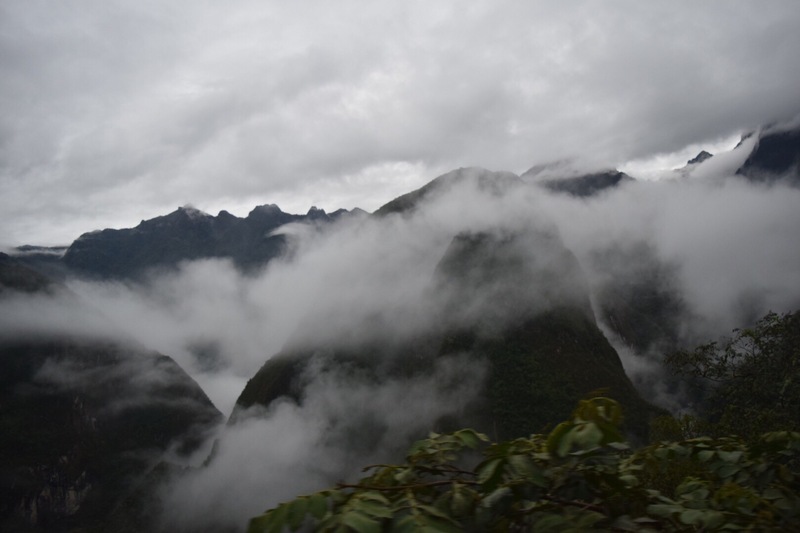 I am not sure how to describe it, there is something magical there…maybe it is the mist, fog and clouds set in those beautiful mountains and then you add some Incan ruins…or maybe it’s just some undefinable energy that courses through MP and I felt that ran through me. It is what I find beautiful in the world, these places of history, these places of beauty and magic, these places that remind you of the potential of humans (to create, to rediscover, unfortunately even to destroy) and the bonds that tie us together. 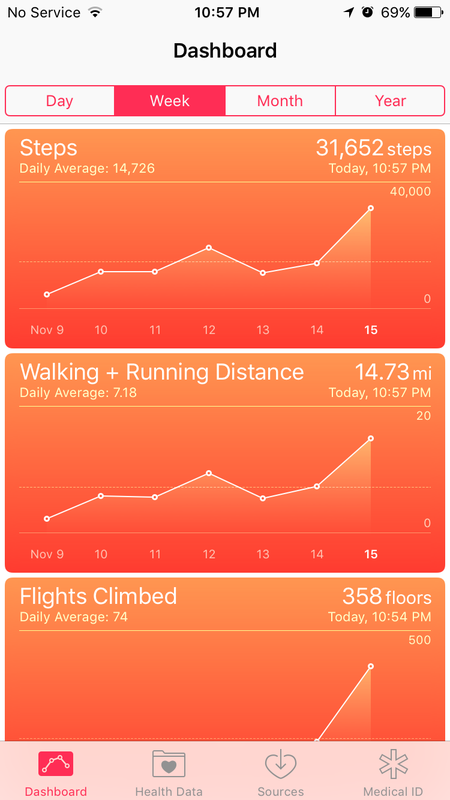 My status update after MP: Completely awe-struck and sore/in desperate need of a massage. And if any one needs a motivational buddy for HP and MP, I am already trying to figure when I can come back! That link is for the first day, and from that post you can find the one for day 2. I hope you will check it out!